Each month, the Hamilton Climate Change Map picks one action to be the Action of the Month. This month they are highlighting the local, grassroots group, Yes We Cannon. 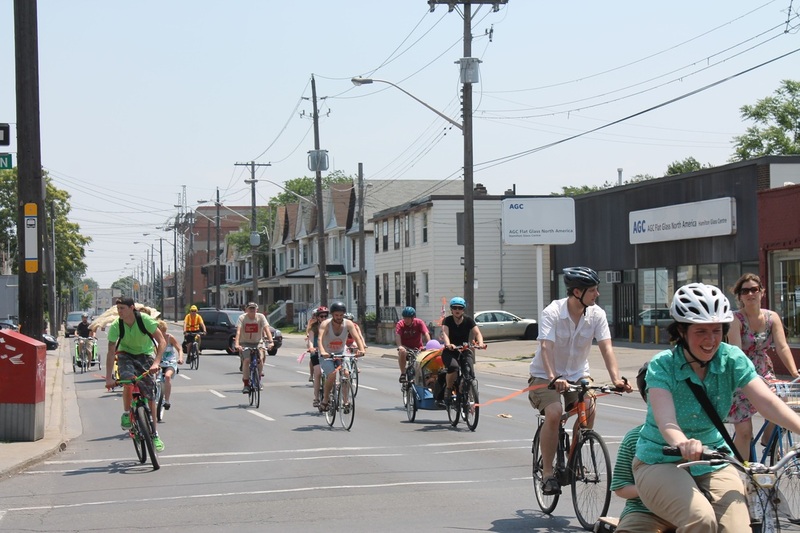 In Hamilton, Yes We Cannon has been engaging and empowering the community over a common goal – improving cyclist and pedestrian safety in the lower city by creating a bi-directional bike lane on Cannon Street. Yes We Cannon is a citizen’s group focused on creating a safe transportation route for cyclists along Cannon Street in Hamilton, Ontario. Officially launched in May 2013, Yes We Cannon and has been a great success. More than 2,300 residents signed a Yes We Cannon petition calling for segregated, bidirectional bike lanes on the fast-moving, four-lane artery and on September 5th, city councilors approved a pilot project which would place bike lanes on Cannon Street between Sherman Avenue and Bay Street. Grassroots efforts were the main push behind the pilot project creating the longest stretch of protected two-way bike lanes in the City and providing a safe cycling route from east to west across the lower city. The Yes We Cannon campaign only launched in May of 2013 but gained widespread support throughout the City of Hamilton through various outreach and engagement initiatives, including riding with students on Bike to Work Day in May and a Bike Parade in June, which resulted in the motion to create the bike lane. Interesting article here about the insurance industry and its relationship with hybrid cars. The article is informative in general, although the list of “best hybrids” is particularly interesting. Funny that the writers of the article chose to “promote” the Chevrolet Volt in fourth spot when the linked article from which the rankings are taken clearly shows three Toyota Priuses (should that be Priusi ?) sharing the spot overall and the Volt in 7th.Either that or the list is a “living” document that constantly updates- not sure why there is a discrepancy. Either way though, the article makes the good point that the insurance industry in the US is looking favourably at hybrids. 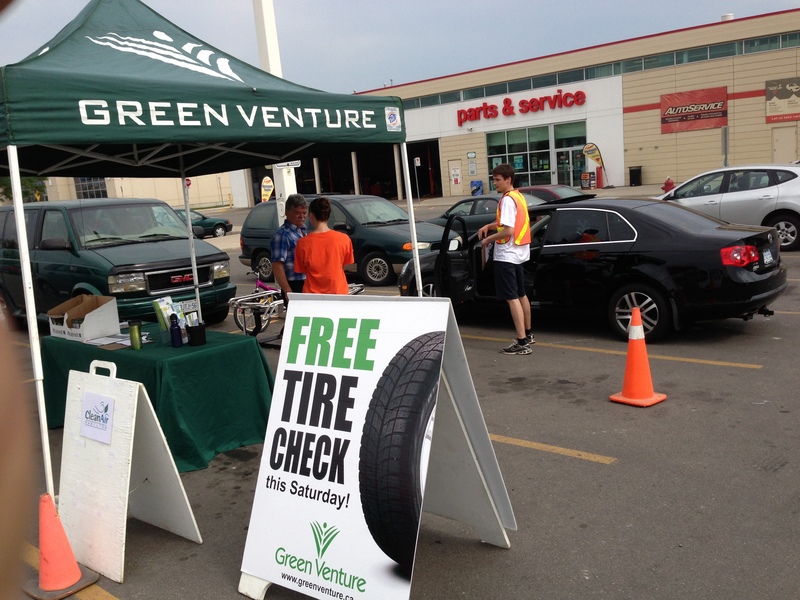 This summer, Green Venture has been working with Canadian Tire Stores to deliver Tire Pressure Clinics to the community. These clinics were made possible from the Shell -Fuelling Change grant awarded to us last year, in addition to support from Clean Air Hamilton. During these events, we teach motorists how to check their tire pressure. If required, we also fill up people’s tires, and provide them with EcoDriver information and a giveaway item. These events are a great way to engage the community and teach them sustainable driving techniques. After attending these clinics, people learn how to save money on gas, while reducing their use of fossil fuels. Why Attend a Tire Pressure Clinic? These events teach us how to live a little more sustainably while driving, and we would love for you to participate! Our next Tire Pressure Clinic is this Saturday, July 6, 2013. The location is 777 Upper James St, Hamilton, ON.